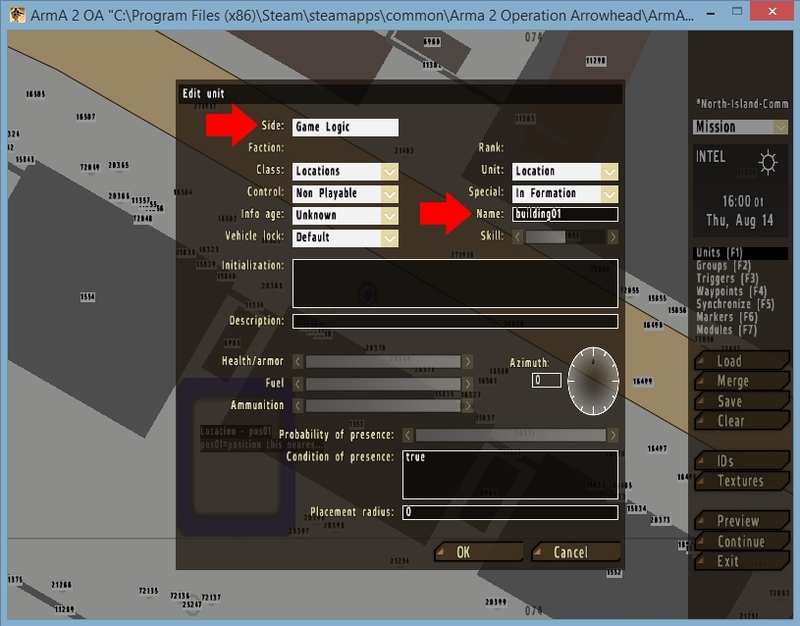 Click the 'Units' button on the right sidebar and place down a 'Game Logic' unit on the building. Give it the name 'building01'. 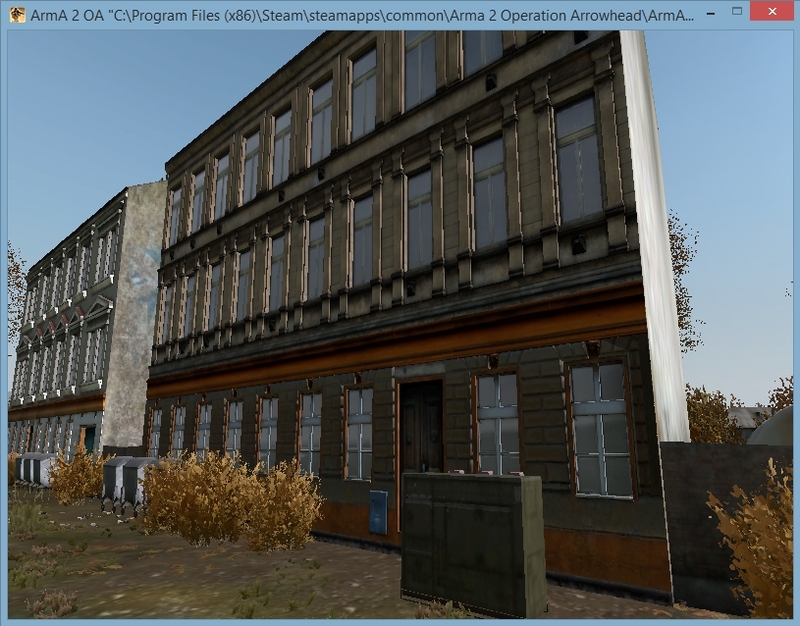 Create a second 'Game Logic' unit atop the building and name it 'target01'. Make sure the two units are not grouped - you will have more flexibility on where you want the explosion to occur. Click the 'IDs' button. 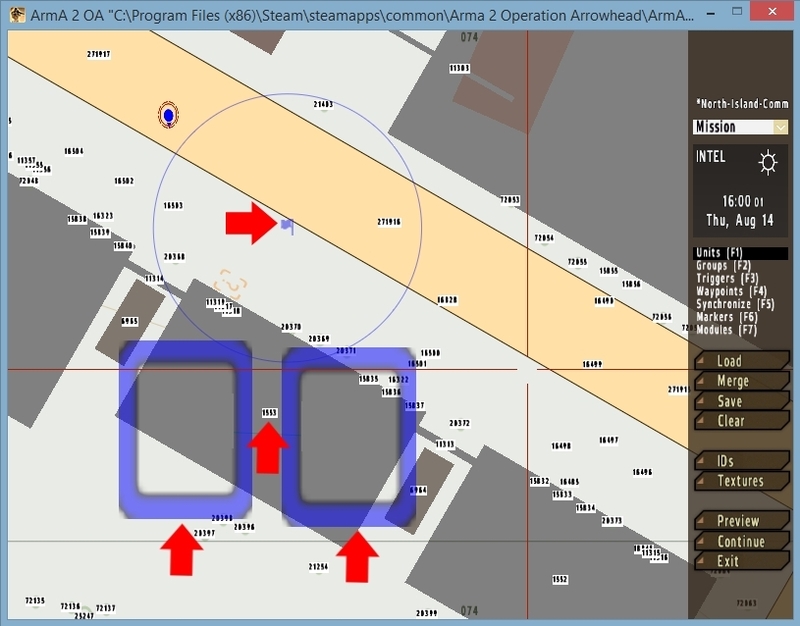 You will see every map object ID displayed. Find the ID for the building, which is 1553 in this case. 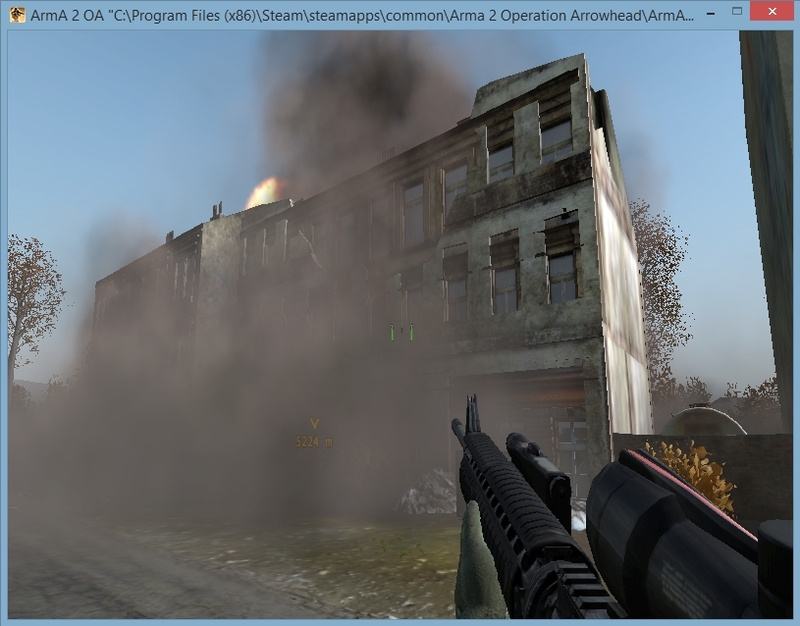 Any player stepping into the trigger will detonate the explosion and destroy the building. Instead of using a trigger to activate the bomb we will now set up a detonator that a player can use by clicking. The same building will be utilized and the detonator will be a power generator unit previously placed near the front entrance. 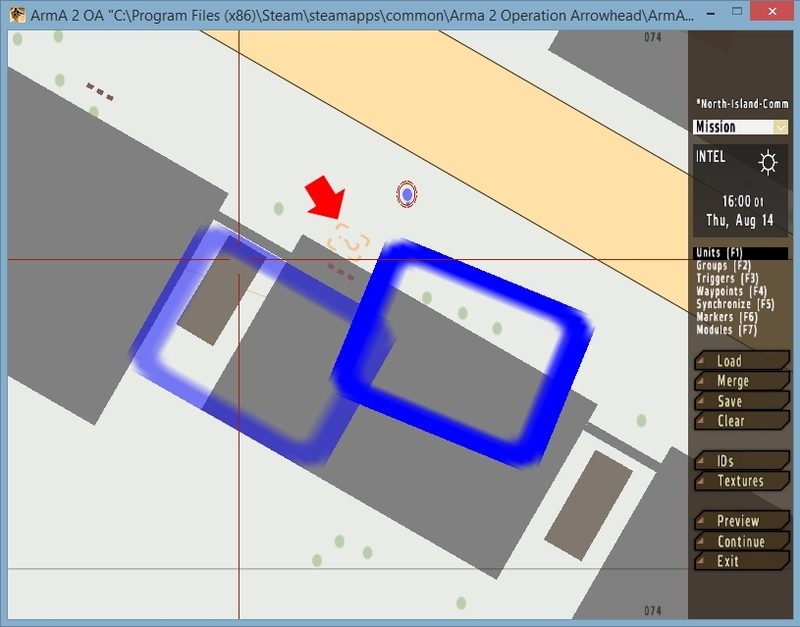 As in the triggered timer tutorial, place down two 'Game Logic' units (ungrouped) on the building and name them'building01' and 'target01'. 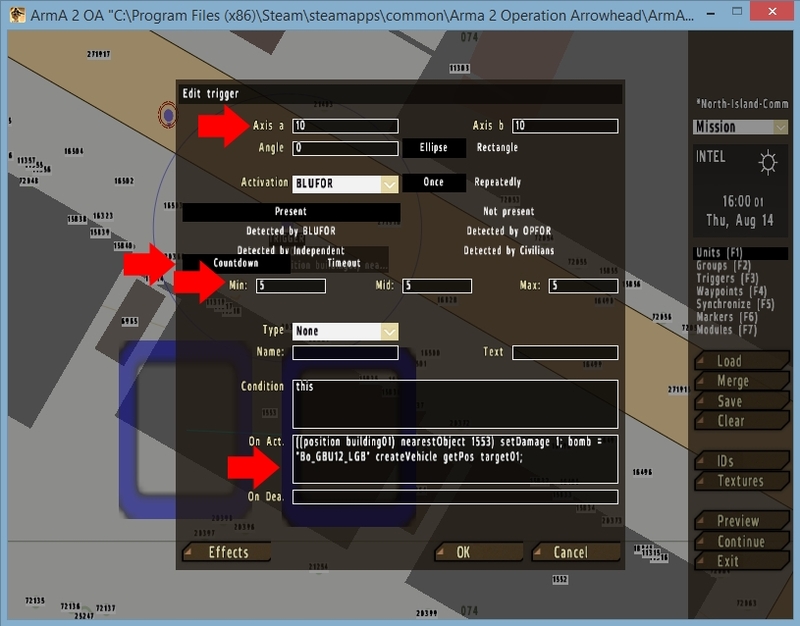 Save it as explosion.sqf and drop it into your mission folder. In the set up image below you will the the detonator (orange dashed rectangle with question mark) and the two game logic units. This time I positioned target01 further out toward the street for a more dramatic effect. Once the detonator is clicked the player will be give a warning that they have thirty seconds to depart. 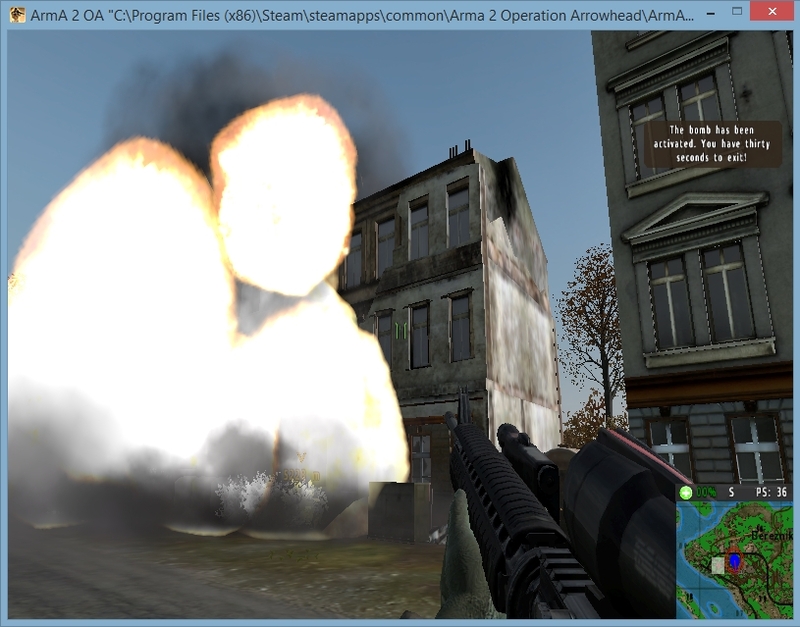 Line two of the explosion.sqf script is optional. This is the sound effect for the detonator button being pushed. The target bridge is in the image below. It is comprised of four sections, each with its own ID number. 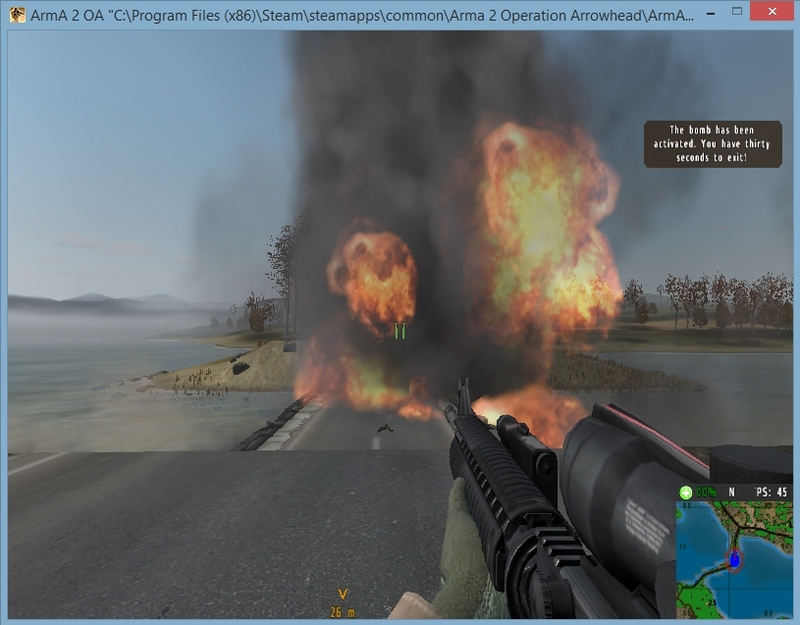 For added impact two vehicles (UAZ Russia models - nice fireballs) have been positioned on the bridge and converted into bombs. First we must gather all the ID numbers which are 243235, 241951, 243237 and 243237. Now place down a game logic unit just to the right of the bridge and name it 'bridge01'. Set down four more game logic units, each one positioned directly over the individual sections of the bridge. Name each one 'section01', 'section02', 'section03' and 'section04'. Place two+ UAZ's on the bridge and name them 'bridgeveh01' and 'bridgeveh02'. Place down five triggers in overlapping concentric circles, just slightly off from one another with the radius' at 5. The offsetting is simply so that you can see them, whereas if they completely overlapped they would appear to be one trigger and would be unmanageable. 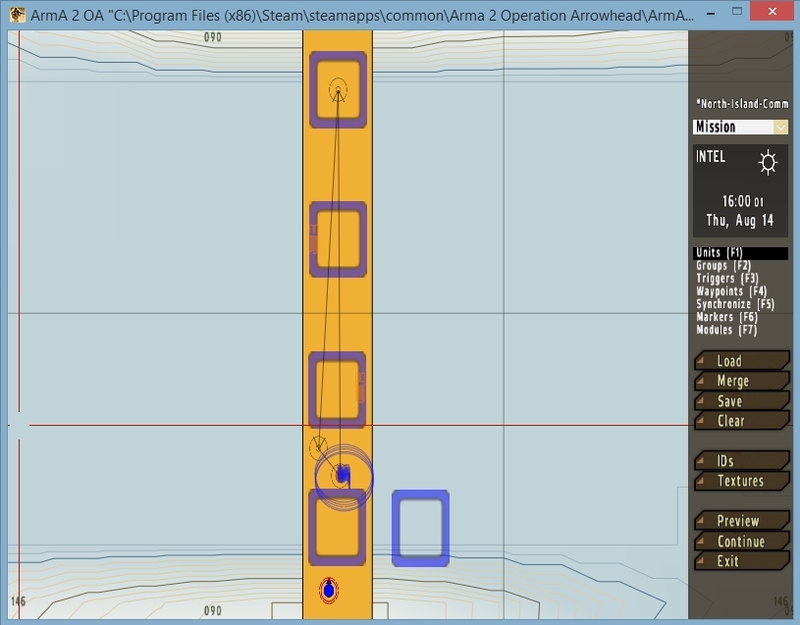 The thin lines with arrow pointers are the waypoint paths for our hapless OPFOR bridge guard and are not necessary for this bridge exercise. You can read more about these in my Implement Looping Waypoints tutorial. 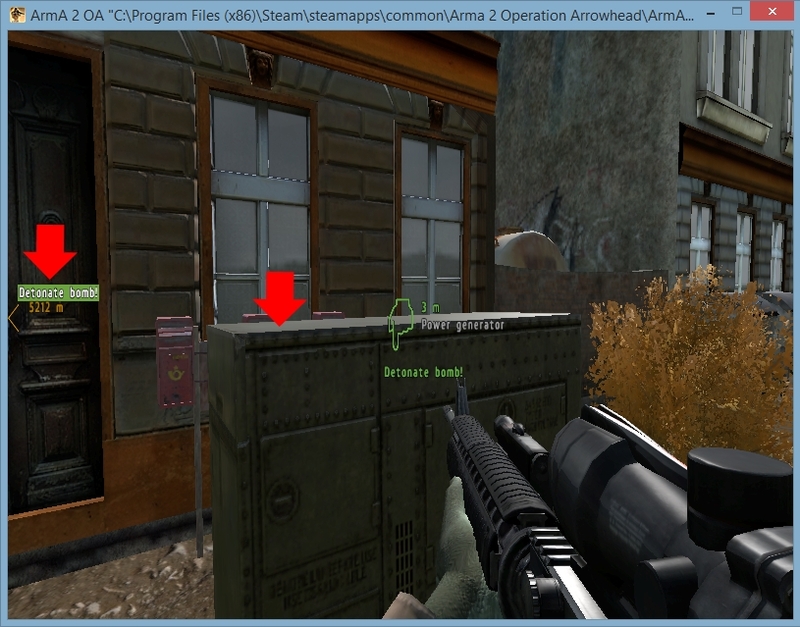 You would use this to alert players that the bomb has been detonated when they step into the trigger area. 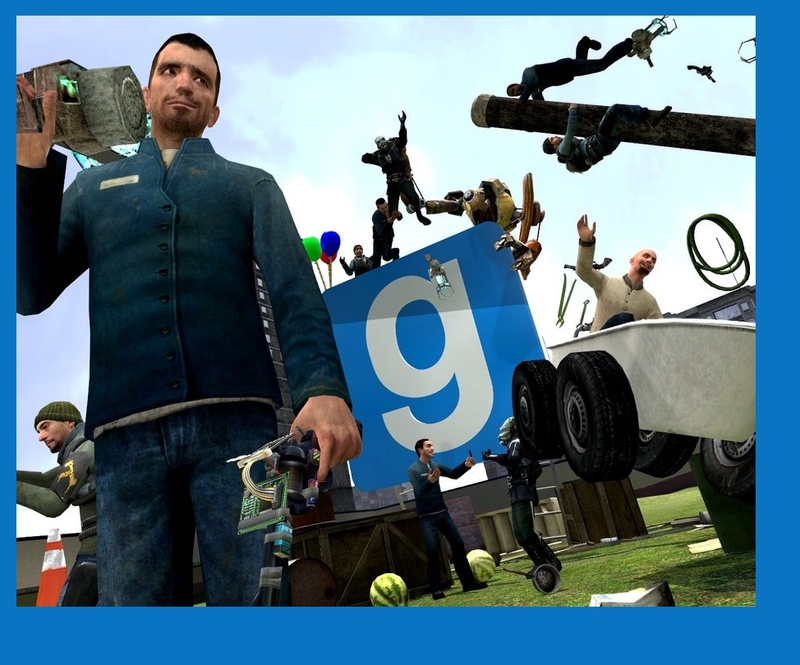 If you do not want to use this then delete the trigger. 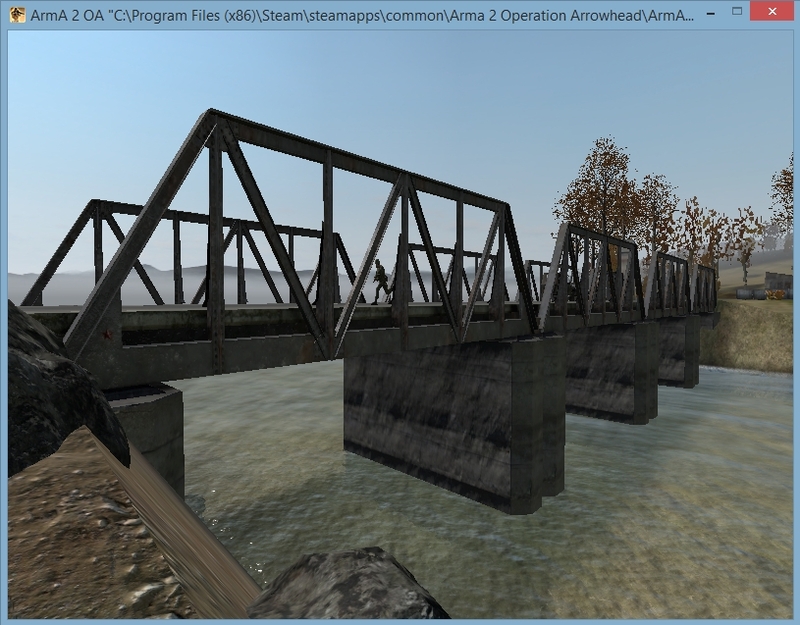 'position bridge01' refers to our first game logic unit, which was placed beside the bridge. This unit will be used by all four sections. 'nearestObject 243235' is the ID number of the first bridge section. 'getPos section01' is the game logic unit positioned over object ID 243235. The third line that references 'bridgeveh01' is what turns the UAZ sitting over section two into a bomb. To create a chain reaction explosion, you will need to go back into each timer and first choose the side in the 'Activation' drop down that you would like to have trigger the explosion. Then you will need to click the 'Countdown' text. Finally, enter the delay in seconds in each 'Min' 'Mid' and 'Max' field. Each trigger should be offset by at least a second, with two seconds being preferable. Example: trigger one = 30 seconds, trigger two = 32 seconds, trigger three = 34 seconds and trigger four = 36 seconds.